Pot Of Gold Festival – Knox Hamilton Interview. | #StyleHeirs. Pot Of Gold Festival – Knox Hamilton Interview. [TEMPE, AZ.] This coming weekend the Pot of Gold Festival attendees will have the chance to escape this hard winter and satisfy their Spring-time craving. The four day event begins this Friday the 13th, takes a break from the stage on Monday then closes out on Tuesday for St. Patrick Day. Among several headliners such as Bastille, Kendrick Lamar, Fall Out Boy, Korn and Godsmack we also find a variety of new comers like Milky Chance, Echo Smith and Joywave. Also among the new comers is Knox Hamilton a band made up of siblings and close friends from Little Rock, Arkansas. After signing with a label last year the band dropped their single ‘Work It Out‘ which has topped the Billboard charts reaching as high as number thirty-seven. Currently ‘Work It Out’ is the only song fans have immediate access to as they have yet to release a full album. 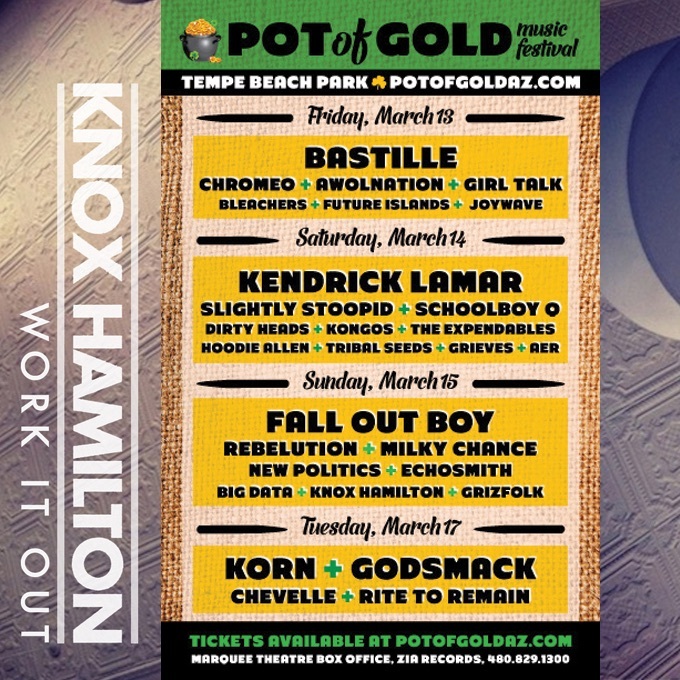 Special thanks extended to Suzanne for setting up an interview with lead singer Boots Copeland from Knox Hamilton about their upcoming set for the Pots of Gold Festival on Sunday the 15th in Tempe Beach Park. According to Copeland the quartet has played in Arizona a few times already, mentioning “We can’t wait to warm up” referring to the fact they’ve been home in Little Rock where it’s 35 degrees and this week in Tempe the days will be in the high 80’s. There’s a certain work-it-out mindset that Copeland keeps with as he writes majority of their music. He reflects on his seven year marriage with his wife and the debates they’ve encountered have all been resolved by laying it all on the table and working it out together. With the responsive radio chart-topping status Copeland speaks for himself on his thoughts about the groups impact saying “I think it’s pretty cool to know you’ve reached a person you never knew existed.” It’s clear to see the song is reaching plenty of people as it’s been on Serious XM’s ALT nation’s top 18 for months and again, as well as 4 weeks on the Billboard 200. Next Sunday, Copeland added that the Pot of Gold’s set will be mostly filled with “up tempo, dance the night out, pretty energetic music.” He asks that fans “come expecting to dance in the nice weather because it’s weird playing for dead faces in the crowd!” Make your way to the Pot of Gold Festival this weekend for some much needed sunshine and be sure to catch Knox Hamilton’s blend of retro-dance-rock and indie-pop on stage at the Tempe Beach Park. Like a Leprechaun Protect your POT OF GOLD FESTIVAL TICKETS! Check back later for a post concert review with photos of all the luck we stuck. ← Sons of William FW15.